London 2014―Catherine Howard stumbles upon the tomb of her granddaughter, Anne Howard Brandon, who'd been swept back through time. Horrorstruck, she discovers Anne was murdered in the year 1562. Elizabethan England 1562―Dr. Jonathan Brandon, Anne's husband, pens a desperate message to Catherine, which gives the details of his wife's kidnapping and murder, and the plea to "find a way to undo this!" Upon discovering the ancient letter, Catherine calls on a time-traveling priest, Father Daniel, to rescue her precious granddaughter. But journeying back to the sixteenth century is a dangerous undertaking, the life and death risks sobering and real. Will Daniel survive? Can anyone thwart the evil that threatens Anne, or is the timeline immutable, her fate sealed? Daniel calls upon the forces of heaven and earth―including a secret Vatican society of time travelers―to aid in this quest. Will they be able to help? Can they change the course of history? Will time rewind? Ever Crave the Rose (The Elizabethan Time Travel, #3) by Morgan O'Neill is a Time's Arrow Productions publication. The characters are strong, well-drawn, and developed and the dialogue is crisp, and true to the era. The book is well- researched, with a real authenticity to it, as it features real life characters, from the Elizabethan age. I was riveted, and completely absorbed in the story from start to finish and I loved the way the story all came together in the end, although there are a few moments of sadness, along the way. There is a bit of twist in there too, which gives me hope that there will be more adventures upcoming in this amazing series!! 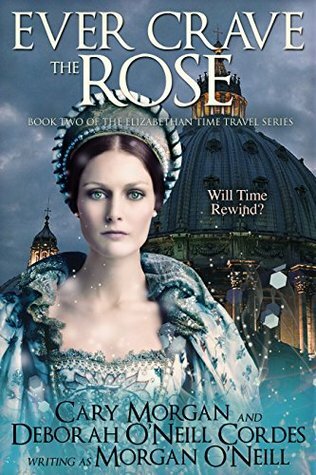 Fans of this series, lovers of historical fiction, time travel, and romance will not want to miss this one! ALSO AVAILABLE IN THE KINDLE UNLIMITED PROGRAM! 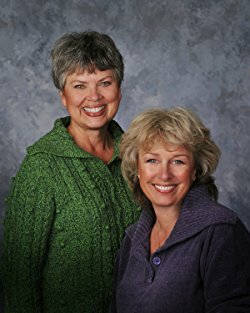 A chance meeting at a writers' conference brought Cary Morgan and Deborah O'Neill Cordes together, two award-winning authors who connected because of a mutual love of time travel fiction. Collaboration ensued, the search for a pen name the first step in their working relationship. Their maiden names provided the solution - and "Morgan O'Neill" was born. 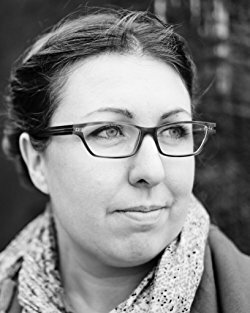 Cary and Deborah's backgrounds are uniquely suited to writing stories steeped in atmosphere and history: Deborah has a master's degree in history and is a dedicated genealogist; Cary is a talented linguist in French and is currently a student of Latin. They've traveled to Europe's ancient and medieval sites many times, with Cary living on the Continent for five years. The Morgan O'Neill time travel novels have received a number of literary awards, including two finalist wins in the Booksellers' Best Awards, two semifinalist wins in the William Faulkner-William Wisdom Creative Writing Competition, first, second, and third place wins for the Mainstream Novel with Strong Romantic Elements category of the Golden Rose Contest, a top ten finalist award in the Pacific Northwest Writers' Conference Zola Awards Literary Contest, and a top ten finalist win in the Orange Rose Contest. When Eleanor Duncan rescues the unusual black cat from a university parking lot, she suspects he has run through at least eight of his lives. But it’s his ninth, and potentially last, that concerns her most. Alarming events appear to have followed him into her life. Eleanor is assaulted by a stranger and interrogated by the CIA. More terrifying is her husband’s seeming return from the dead. A trip to veterinarian Peter Curry reveals an even deeper secret. Familiar is an escaped research animal. The secret he carries opens the door to conspiracy, danger, and romance. Peter and Eleanor are determined to save the black cat’s life and prevent his return to the lab. Their decision to help Familiar turns their world upside down—and begins the saga of Familiar, the black cat detective. Fear Familiar by Carolyn Haines (Caroline Burnes) is a 2017 KaliOka Press publication. When Eleanor Duncan and a scruffy black cat more or less rescue each other in a university parking lot, she decides to keep him, aptly naming him ‘Familiar’. But, Familiar needs a vet so she takes him to visit Dr. Peter Curry, who gives Eleanor shocking information regarding an animal research center, and feels Familiar was a recent and lucky escapee. Sure enough, someone wants that cat back in the worst possible way, and Eleanor soon finds herself embroiled in a web of conspiracy, intrigue and danger, which could put her life at risk. This plot is very complex and original, and although the book was published back in 1989, it seems to have aged well, although it is clearly written before smart phones and other modern technologies, and you might catch an outdated phrase, or reference here and there, but mostly it goes unnoticed. Eleanor’s character goes through a transformation, becoming stronger and wiser, as she struggles to control the ghosts of her troubled past, and get to the bottom of this puzzling mystery, discovering she has more strength and courage than she thought possible. 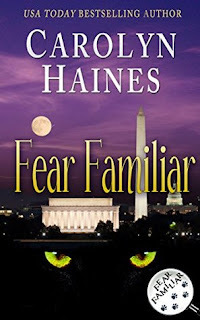 ‘Familiar’ has his own ‘voice’, and he allows the reader to ‘hear’ his thoughts and follow his actions as he does his part to keep Eleanor safe. He’s one smart cookie, with cute observations about humans, and is a delightful part of the story. The story is fast-paced and absorbing, with lots of action and a little romance, too. This book laid a solid foundation in which to build what would become a long running series that began in 1989 and ran through 2009, I believe, and is a testament to how popular it was. I would love to read them order, someday, so I hope they all show up in the kindle store someday. In the meantime, the series has been revived with a ‘second generation’ of adventures featuring Familiar’s son- Trouble. You can even read them concurrently and double the fun! I enjoyed becoming reacquainted with Familiar and his charming disposition. This series brings back fond memories and is a little nostalgic for me. So, I’m very happy this series is getting a new life, allowing dedicated fans a chance to reconnect with it, while also finding a new audience. If you like romantic suspense, mysteries, or are a cat lover, you will probably enjoy this series. 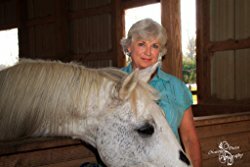 Carolyn Haines is the author of eighteen novels, including the acclaimed Sarah Booth Delaney mystery series. She was honored with the prestigious 2009 Richard Wright Award for Literary Excellence. Haines was also 2010 recipient of the Harper Lee Award. Born and raised in Mississippi, she now lives in Alabama on a farm with more dogs, cats, and horses than she can possibly keep track of! Years ago, Miss Esme Astell fell hopelessly in love with Charles Brittle, an unassuming and highly respectable London bookmaker. Then he disappeared without a word. Can she resist falling again, this time for the dangerous scoundrel he’s become? The Pirate and I by Katharine Ashe is a 2017 Avon Impulse publication. What a lovely, fast paced, adventurous romance!! Esme loved Charles a long time ago, but he never seemed to notice her. One day, he just up and disappeared after losing the woman he loved to another. Two years have passed, and Esme has arrived in Scotland to attend a conference for the Society of Perfumers. From there she hopes to travel to Paris and earn enough money to help her sisters, who desperately need rescuing from a life of poverty. The last person on earth she expected to encounter was Charles Westley Brittle. Not only does she encounter him, they literally run into each other, and she saves his life in the process, but receives a nice, warm kiss as her reward. However, Charles needs Esme’s help in sniffing out a special dog he plans to steal in order to return it to its rightful owner. Unable to resist the promise of adventure- or Charles- Esme finds herself caught up in Charles’ criminal exercises, even after she discovers he is a living, breathing Pirate!! Charles has a complicated past, but he only wants to free himself of the life he’s trapped in and right the wrongs he committed. With Esme’s help, maybe he can get a fresh start in life, for both their sakes. Can these star -crossed lovers finally find a way to merge their plans, hopes, desires, and dreams so they can have a life together? I love a good Pirate tale, but, alas, they are far and few between these days. So, the title of this novella, which is part of the ‘Devil’s Duke’ series, caught my eye, and piqued my interest immediately. To top it all off, Katharine Ashe is one of my favorite historical romance authors, and as such, is one of the rare few who can tempt me away from my ‘romance diet’. I really enjoyed this short, but action packed novella, and loved Esme and Charles’ love story! The couple has an amazing chemistry and shared the most delightful dialogue between them. I loved it when Esme constantly referred to Charles by his full name -Charles Westley Brittle- and the way they worked together to accomplish their goals and the sweet gestures they made in order to selflessly help one another. The, oh so intriguing, Gabriel Hume, makes a cameo appearance, and has me practically foaming at the mouth to read ‘The Duke’ coming this fall. Overall, this is a short, but a delightful and very romantic addition to the series, you won’t want to miss. 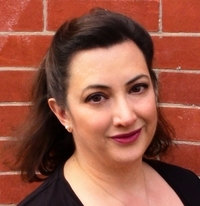 KATHARINE ASHE is the USA Today bestselling and award-winning author of historical romances reviewers call "intensely lush" and "sensationally intelligent," including her acclaimed Devil's Duke Series, and My Lady, My Lord and How to Marry a Highlander, 2015 and 2014 finalists for the romance industry's most prestigious award, the RITA®. A riveting psychological thriller inspired by the never-caught Zodiac Killer, about a young detective determined to apprehend the serial murderer who destroyed her family and terrorized a city twenty years earlier. Caitlin Hendrix has been a Narcotics detective for six months when the killer at the heart of all her childhood nightmares reemerges: the Prophet. An UNSUB—what the FBI calls an unknown subject—the Prophet terrorized the Bay Area in the 1990s and nearly destroyed her father, the lead investigator on the case. The Prophet’s cryptic messages and mind games drove Detective Mack Hendrix to the brink of madness, and Mack’s failure to solve the series of ritualized murders—eleven seemingly unconnected victims left with the ancient sign for Mercury etched into their flesh—was the final nail in the coffin for a once promising career. Twenty years later, two bodies are found bearing the haunting signature of the Prophet. Caitlin Hendrix has never escaped the shadow of her father’s failure to protect their city. But now the ruthless madman is killing again and has set his sights on her, threatening to undermine the fragile barrier she rigidly maintains for her own protection, between relentless pursuit and dangerous obsession. Determined to decipher his twisted messages and stop the carnage, Caitlin ignores her father’s warnings as she draws closer to the killer with each new gruesome murder. Is it a copycat, or can this really be the same Prophet who haunted her childhood? Will Caitlin avoid repeating her father’s mistakes and redeem her family name, or will chasing the Prophet drag her and everyone she loves into the depths of the abyss? 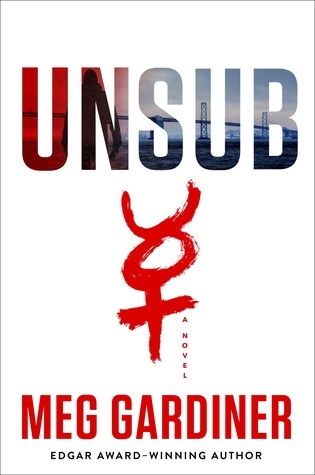 UNSUB by Meg Gardiner is a 2017 Dutton publication. Confession: This is, to my knowledge, the first book I’ve read by this author. I see she has a healthy back list, and I wasn’t unfamiliar with her, but for some reason, which was not at all intentional, I just never got around to trying one her novels. But, when several Goodreads friends left some very positive reviews for this book, and since it was the first book in a new series, I felt like now was the time to introduce myself to Meg Gardiner. Like the infamous San Francisco serial killer, ‘The Zodiac’- ‘The Prophet’ went on five year killing spree, but then suddenly stopped. The case went cold, but it left detective Mack Hendrix a shell of the man he once was. Now, his daughter, Caitlin, who is working her way up the law enforcement ladder, finds herself promoted to homicide when it appears that after a twenty-year absence, ‘The Prophet’ is back… with a vengeance. It's been a long while since I read a traditional ‘serial killer’ crime novel, and this one caught my attention because it made reference to ‘The Zodiac’, which creeped me out, maybe more than any other serial killer case, because no one was ever arrested, and for years, an uneasiness simmered in SF, with residents wondering if the killer was dead or alive - or if he might come out of hiding when least expected. So, a setup which features a diabolical serial killer who reemerges after a lengthy silence, was too good to pass up. The novel seemed to follow a well- worn path along ' procedural avenue', until it steadily morphed into a very smart, very detailed, and atmospheric thriller which puts a fresh spin on an old familiar trope. As with any thriller in which a serial killer is at work, the crime scenes are graphic, and not for the faint of heart. But, if you are thinking about some deranged, sicko, lunatic with the tried and true profile, thing again. This is not your usual baddie, not by a long shot. 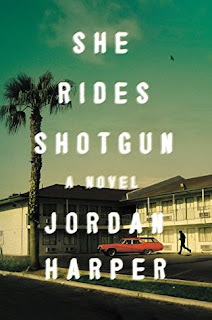 While there are some weak moments, overall this novel was cleverly crafted, with expedient and hair-raising twists, and a stunning conclusion that will segue nicely into the next installment. 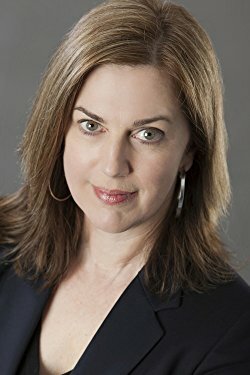 Meg Gardiner is the author of thirteen thrillers. 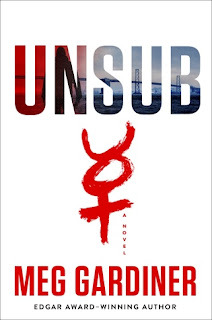 UNSUB, her latest novel, features homicide detective Caitlin Hendrix. Don Winslow says, “Like The Silence of the Lambs, this novel scared the hell out of me. I dare you to try putting it down.” The novel has been bought for development as a TV series by CBS. 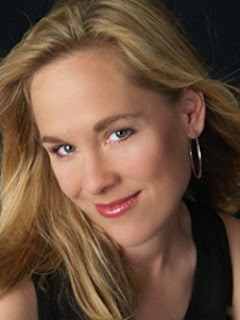 Meg was born in Oklahoma and raised in Santa Barbara, California. A graduate of Stanford Law School, she practiced law in Los Angeles and taught writing at the University of California Santa Barbara. She's also a three time Jeopardy! champion. Meg lives in Austin, Texas. She's the author of the Evan Delaney series and the Jo Beckett novels. China Lake won the 2009 Edgar award from the Mystery Writers of America for Best Paperback Original. The Dirty Secrets Club won the Romantic Times Reviewers' Choice Award for Best Procedural Novel of 2008. She Rides Shotgun by Jordan Harper is a 2017 Simon & Schuster publication. This is the creed of the Ayran Steel white supremacist gang, which is run out of a prison cell by Crazy Craig Hollington, whose power and reach seemingly has no bounds. So, when Nate, kills Craig’s brother, he is tipped off, right before his prison release, that Crazy Craig has fingered him, and has sent out orders to exact his revenge. It’s too late for Nate’s ex-girlfriend and her new boyfriend, but Nate manages to nab his eleven-year old daughter, Polly, before the ‘Steel’ manages to find her. Thus, begins a most unusual father/ daughter road trip, chock full of adventure, danger, and gruesome criminal acts. But, Polly appears to take it all in stride- like father- like daughter, all the way down to their shared ‘gunfighter eyes.’ Although they are strangers to each other in the beginning, their connection is instantaneous, as only blood relations can be, but their bond only solidifies as they fight for their very lives. Will they manage to make it to safety before the ‘Steel’ catches up to them, or is their fate already sealed? I heard many good things about this book, so I had to see what all the fuss was about. I gotta tell you, this one deserves all the kudos and accolades it receives. 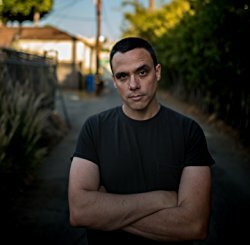 This book has a noir-ish atmosphere, but is a dark and gritty crime novel, that climbs into the disturbing mindset of gangs, and the price paid for living by the sword. Nate’s own background is harsh, and he doesn’t have the verbal or emotional ability to express his feelings to Polly, but in his own way, he does the best he can for her, by putting his own life on the line to save hers. But, Nate also has his own demons and ulterior motives, exposing his flawed and selfish characteristics. However, it is most definitely Polly, who steals the spotlight in this story. She’s vulnerable, clinging to her beloved teddy bear who often speaks or communicates on her behalf, but quickly takes to her new life on the run, almost like a duck to water. She is loyal to her father, and two make quite a team. Along the way, in this very unusual coming of age tale, Polly learns how to cope in an uncertain world, to stand on her own two feet, using the skills her father taught her, but also by realizing her own inner strength, and we know she’s going to be a survivor. Despite her exposure to the mentality of hardened criminals and the underbelly of society, she walks away, miraculously, with her principles in tact. The story also has a strong supporting cast, with people playing both sides and a detective who is perhaps rooting for Nate and Polly, even while he tries to locate them. While this is a brutal and very violent crime thriller, there is an underlying theme that centers on family connections and bonds, which are unbreakable ties, even under the most extreme circumstances. The characterizations blew me away, the pacing is very brisk, and action packed, the dialogue is outstanding and the prose is stunning. If you enjoy crime novels, I don’t see how you could go wrong with this book. Jordan Harper was born and educated in Missouri. He's worked as an ad man, a rock critic and a teevee writer. He currently lives in Los Angeles. For the past thirty years, Mr. and Mrs. Jha’s lives have been defined by cramped spaces, cut corners, gossipy neighbors, and the small dramas of stolen yoga pants and stale marriages. They thought they’d settled comfortably into their golden years, pleased with their son’s acceptance into an American business school. But then Mr. Jha comes into an enormous and unexpected sum of money, and moves his wife from their housing complex in East Delhi to the super-rich side of town, where he becomes eager to fit in as a man of status: skinny ties, hired guards, shoe-polishing machines, and all. The move sets off a chain of events that rock their neighbors, their marriage, and their son, who is struggling to keep a lid on his romantic dilemmas and slipping grades, and brings unintended consequences, ultimately forcing the Jha family to reckon with what really matters.. 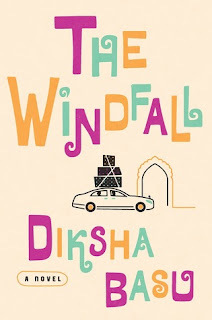 The Windfall by Diksha Basu is a 2017 Crown publishing publication. Books can take you anywhere and everywhere, without leaving the comfort of your own home. I’ve been trying to incorporate more ‘cultural’ books in my reading diet, and have been loving it, but the synopsis for this book had me feeling a little nervous. I passed on the book several times, because I know so little about the manners, customs and culture of India, I was worried I wouldn’t ‘get’ the humor or understand the complexities of the novel. But, the book just kept showing up on my radar like it was begging me to try it. So I gave up and checked it out of the library. Naturally, you will probably enjoy this book more if you are familiar with the customs of India, but you don’t have to be an expert to get the general gist of the story. What really sold me, was the characterizations and dialogue, which, despite my unfamiliarity with Indian culture, was hilarious and utterly charming, and pretty much spot on, when it comes to how one handles a sudden overnight accumulation of vast wealth. The most puzzling character was the Jha’s son, Rapak, who is attending school in America. He seems to adapt well, for the most part, to America, and even has an American girlfriend, but, while he wishes to totally embrace his new life, he is still tied to the traditions and values he was raised on, which becomes such a conflict for him, he can't decide who to be, and winds up struggling with his studies and relationships. I’m not sure I liked him, especially, because he was too wishy washy and lacked depth. But, he does eventually pull his head out enough to pacify me. One of my favorite parts of the book, features a young, childless widow, who longs to embrace life again, but is terribly lonely, wistfully dreaming of a love match. I loved the unexpected romance that develops for her which was quite lovely. But, at the center of the story is the jarring adjustment the Jha’s must make as they leave their close- knit housing community, where everybody knows each other, (and your business), to a quiet, wealthy neighborhood. Mrs. Jha misses her friends, and does not embrace the trappings of wealth in the same way her husband does, which of course reveals much about how money has affected their marriage and individual priorities. A bit of a competition arises between Mr. Jha and his new neighbor, Mr. Chopra, which is the best part of the story. No matter how hard you try, or not- acquiring sudden wealth will change you to some degree. It will have an effect on your relationships, your perspectives, or even your value system. The Jha’s find that money- surprise, surprise- does not bring true contentment after all. Perhaps they had been rich all along, only didn’t appreciate it until their monumental shift in fortune begins to bring about more stress than happiness. While cultural, gender, and social conflicts are evident in the story, the family dynamics are at the very heart of the matter. The family must work together to hold on to all that is dear, help each other through giant, swift changes in order to keep the family unit functioning, while they find a way to adapt. There is an underlying current in the story at times, that hums alongside the hilarious one-upmanship games, which suggests that beneath the veneer of societal expectations, is a pressure cooker of tension and fear, that threatens to explode, but in this case, it ultimately dies out with a whimper instead of a roar. This approach kept the tone light, and the tension muted, which was in accordance with the atmosphere and tone of the novel, but perhaps it may have dulled the dramatic elements just a little bit. The ending is warm and satisfying, even though the story kind of lost a little momentum there at the end for some reason, but overall, I found it to be enlightening, an easier read than I was expecting and I really enjoyed learning about New Delhi and more about Indian customs. Diksha Basu is a writer and occasional actor. 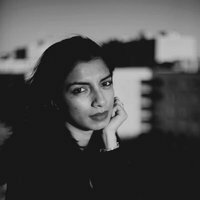 Originally from New Delhi, India, she holds an MFA in Creative Writing from Columbia University and now divides her time between New York City and Mumbai. Welcome to The Book Review's SATURDAY'S SERIES SPOTLIGHT !! What is a series spotlight, you ask? I am always starting a new book series, but I also have a habit of starting long running series, which means I get to hunt down all the volumes, hoping to read them from start to finish. This means I get to enjoy older books that are a new discovery for me. Unfortunately, older =books don't get the same interest as new releases, which means my readers may be missing out on some really great books. So, each Saturday, I will feature a book from a series I am working my through them. Mostly, I will highlight a long running series, but I will also feature new ones too, and keep you posted on the latest installments. Mr. Churchill’s Secretary by Susan Elia MacNeal is a 2012 Bantam publication. I enjoyed this first book in the Maggie Hope series. 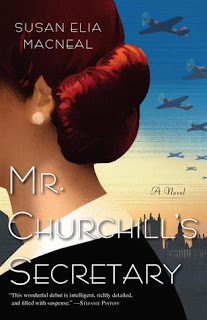 Set in Britain, just as the country enters the second world war, Maggie Hope is asked to work as a secretary for Prime Minister Churchill. Maggie had arrived in Britain to sell the old Victorian house she inherited from her grandmother, but ended up living in the home with an eclectic group of roommates. Although with her incredible mathematical abilities, she is very over qualified for her new job, as a woman, she finds herself relegated to taking dictation, but before long, Maggie begins to decipher codes, while also inadvertently discovering a shocking family secret. Before she knows it, she is helping to flush out a spy, and doing a little investigative work concerning her own family, which is somehow connected. When all is said and done, Maggie’s life will have taken a turn into a new and unchartered course, not only with her career, but in her personal life, as well. This novel is, of course, a mix of fact and fiction. There are ‘real life’ characters in the story, but it is not intended to be taken too literally. I liked Maggie, who is a person well ahead of her time, is quick on her feet, and very smart, which earns her the respect of her male friends and colleagues, albeit, grudgingly at times. The plot moves along a quick pace, but the characters have time to develop, which is especially important in the a ‘first in a series’ novel. There were several ‘whiplash’ twists and surprises I never saw coming, which I loved, plus, I liked the tone of the story, which includes some interesting dialogue and political debate, a mountain of intrigue, with a little bit of romance blended in for good measure. I didn’t really know what to expect when I started this book, but this series starter, was interesting enough, and the spy angle was a nice surprise. Overall, I think the series got off onto solid footing, so I’ve queued up the next three books from the library. New York Times-bestselling author Susan Elia MacNeal is the author of the Maggie Hope Mystery series from Bantam/Random House. She is the winner of the Barry Award, and her books have been nominated for the Edgar, Macavity, Agatha, Thriller, and Dilys Awards. Alice Love is twenty-nine, crazy about her husband, and pregnant with her first child. So imagine Alice’s surprise when she comes to on the floor of a gym and is whisked off to the hospital where she discovers the honeymoon is truly over — she’s getting divorced, she has three kids and she’s actually 39 years old. Alice must reconstruct the events of a lost decade, and find out whether it’s possible to reconstruct her life at the same time. She has to figure out why her sister hardly talks to her, and how is it that she’s become one of those super skinny moms with really expensive clothes. Ultimately, Alice must discover whether forgetting is a blessing or a curse, and whether it’s possible to start over. 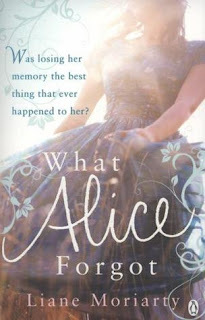 What Alice Forgot by Lianne Moriarty is a 2010 PanMacMillian Australia publication. With so many books out there, there is bound to be an author that slips by unnoticed, and for me, sadly, Lianne Moriarty falls into that category. I knew her books were well received and popular, but I could never seem to find the time to fit one into my schedule. But, my local overdrive library heavily promotes her books, so finally, I took the plunge and put a couple of them on hold. This book turned out to be an excellent introduction to this author’s work and I can certainly see why her books are well liked. I absorbed this story like a sponge, savoring every nuance and subtlety. It was a coincidence, this book has an underlying Mother’s day theme, so it was fitting I found myself reading it this week. The story centers around Alice, a woman on the cusp of her fortieth birthday, who takes a serious tumble, and hits her head hard enough to cause severe memory loss… ten years of lost memories to be exact. Alice believes it is 1998, while in reality it’s 2008. A lot can happen in ten years, and for Alice it’s confusing, heartbreaking, scary, and sad. Also contributing to the story is Alice’s sister, Elisabeth and her adopted grandmother, each realizing, via Alice’s switch back to 1998, how they have lost their way or let time slip away from them. Amnesia plots are tricky in many aspects, but this story has a definite whimsical quality to it, despite the heavy issues at hand, and was handled adeptly. Alice and Nick are on the brink of divorce, but why? A tragedy has occurred, but what happened? Will Alice get her memory back? If she does, will she change or go back to being her old self again? Wouldn’t it be interesting to go back in time and basically get a do-over? What changes would you make? Were you a better person back then than you are now, or vice versa? It’s so easy to allow our careers, and other outside forces, to take over, slowly infiltrating our lives, changing us and bending us until we lose sight of our true goals and priorities. If we were given the opportunity to see ourselves a decade into the future, would we like the people we became? Would be proud of our accomplishments, or would we feel sad by the way we traded love and relationships off for money, houses, and careers or allowed others to interfere or invade the goodness we had? Would we regret our choices? This story will challenge you to take a good hard look at your life and the choices you have made. Don’t forget the things that matter most, like your marriage, your children, and your family. Friendships are important and work is a huge part of our lives, but they shouldn’t be the most important thing, nor should they become an undue influence on our relationships or personality. Many will see themselves in this story in one form or another, and can relate to busy, busy, busy lives, the irritants that pop up in married life, the ups and downs, the resentments that can settle in, the trite grudges, the awkwardness of coping with friends who split up and feeling loyalties divided, or maybe from having to compete with a friend for your spouse’s attention, with jealousy rearing its ugly head as a result. How common is Alice and Nick’s story? But, Alice is not the only one who has gone through incredible changes. Her sister’s struggles with fertility have left a mark on her, which has changed her personality and the dynamic of her own marriage. My heart went out to her, but I’m happy she considered all her options and was so proud of how she persevered in the end. The other story regarding Alice and Elizabeth’s adopted grandmother was also poignant and sweet, but I do wish we had been given more one on one conversations with her, instead of merely reading her thoughts via letters written to an old beau who died many years ago. Overall, this is a unique and thought provoking story, and perhaps a cautionary one too, but one that is full of second changes and hope that left me feeling at peace now that all is as if should be. I am really excited about this author now and have already queued up another of her novels. 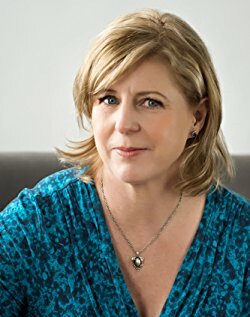 Liane Moriarty is the Australian author of six internationally best-selling novels, Three Wishes, The Last Anniversary, What Alice Forgot, The Hypnotist’s Love Story and the number 1 New York Times bestsellers: The Husband's Secret and Big Little Lies. The Husband's Secret has sold over three million copies worldwide, was a no. 1 UK bestseller, an Amazon Best Book of 2013 and will be translated into over 40 languages. CBS Films has acquired the film rights. With the launch of her novel, Big Little Lies, which has sold over one million copies in the US alone, Liane became the first Australian author to have a novel debut at number one on the New York Times bestseller list. An HBO series based on the book is currently in production with Nicole Kidman, Reese Witherspoon and Shailene Woodley playing the three lead roles. Liane’s newest novel, Truly Madly Guilty, will be released in July 2016. From the instant New York Times bestselling author of blockbuster thrillers In a Dark, Dark Wood and The Woman in Cabin 10 comes Ruth Ware’s chilling new novel. 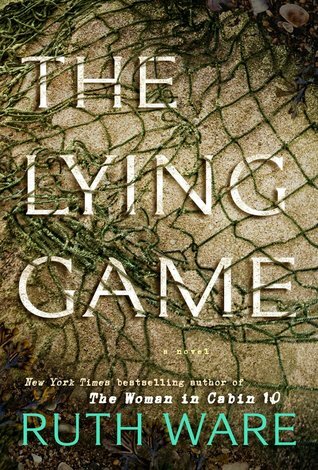 The Lying Game by Ruth Ware is a 2017 Gallery Scout publication. This latest thriller, by Ruth Ware, is an all- consuming, riveting tale, full of mind games and edgy suspense. Isabel, Kate, Fatima, and Thea became fast friends while attending Salten boarding school, as teenagers. They began ‘the lying game’ to liven up their stay at the school, garnering them a terrible reputation on campus. But, ironically, their practice of lying came in handy, when they found themselves involved in a scandal that forced them out of the school. This story is moody and atmospheric, with a heavy feeling of foreboding percolating in the background. Ware had me on edge right from the start and kept me there until I crossed the finish line. The consequences of lying are numerous, and we all know that lies cultivate more lies. It’s a vicious cycle. But, it’s especially brutal for Isabel, Kate, Thea, and Fatima, who have all lived with their lies, precariously balanced on a precipice, knowing their dark secret could be discovered at any moment. When it looks like their worst fears are about to be realized, it forces them to polish up their lying skills once again… only this time, it’s not a game. Isabel is the narrator of this story, and gives an accounting of the girl’s pasts, and the events of the present that brought them back together after all these years. With her stable home life at stake, Isabel has a great deal to lose if the truth were ever exposed. But, all the characters are complex and flawed, nervous, and jumpy, and under an equal amount of pressure. But, with their reputations preceding them, it is impossible to completely trust any of them. I enjoyed the setting in this one, the guessing game, the dramas, confessions, and the surprising twists, all of which are important for any psychological thriller, but this book almost has a Gothic undertone, which of course, I found very appealing. The suspense is mostly derived from the foreshadowing of doom, and is much more psychological than thriller, if that makes sense. Ware’s style, after only two novels, won her the moniker of ‘the Agatha Christie of our time’, but, this one may seem like a kinder, gentler version of Ware, who seems to have altered her style of writing just a little bit with this one. This one is not quite as gritty as her previous novels have been, but I liked the more in -depth characterizations and the clever way she creates long lasting suspense that hangs in the air like a mist that refuses to burn off, becoming murkier and more intense as the story proceeds. But, never fear, there are still lots of surprises and twists that will catch you off guard. Overall, this is another very solid performance from Ware, and I enjoyed this one, especially appreciating the tone, which is very much the style of suspense I enjoy most.